As a general rule I tend to dislike breaking down fairy types by the place they live. After all; cats, bed bugs, mice, and people all live in houses too but that doesn't make us all the same thing. Never the less there is something to be said for discussing the magical ecology of homes, villages and cities. This, however, is a very complex endeavor as there are many, many, many types of fairies that can live in people's home, not all of which are easy to classify. 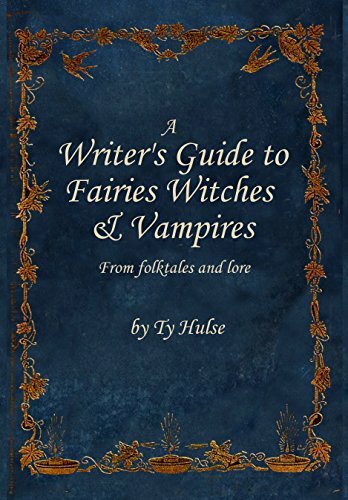 To begin to understand house fairies I'd like to use an example of a story I include in my most recent book "From Celtic Fairies to Romanian Vampires." "There was a Frisian named Harro Harrsen. When he was planning on building a home he saw a hole in a log, he realized that it would make the perfect place for a little Niskepuk to live. So he built a home, and when it was finished he nailed a board as wide as his hand to act as a trim beneath the hole. He put a bowl filled with gruel and plenty of butter on the trim and in a friendly way called, "Come, loving Niskepuk!" He didn't have to wait long for the Niskepuk's came to look over his new home, which they danced through. Only one of them - who was three inces tall - stayed, living in the hole in the piller in Harro Harrsen's home." At one time people wanted fairies in their homes, a home without a soul was well, soulless, it couldn't thrive and neither could the people who lived within it. Yet like all human fairy relationships this was a complected one. A lot of wilderness fairies will pass through people's homes, tumbling down the chimneys, in through cracks in the walls, under the doors, etc. Often the Celts would leave clean water out for passing fairies to bathe in and wash their children. Others would leave food and drink out for the wild fairies. Indeed there was always the fear that if one didn't provide the wild fairies with something to drink they would come looking for human blood to slack their thirst. Other wild fairies would enter homes to play with children, to cause mischief, to steal. The (Buffadello) of Italy is one wilderness fairy which lived in nut trees. They would frequently enter homes in hopes of playing with children. They would also cause general havoc around the house. Running up and down the stairs at night, pulling the covers of people, tickling feet, and more. In North England Ainsle came down the chimney and played with a boy at night. She seems to have been a bit of an attention seeker as many fairies are. Showing off her magical ability to create illusions and her artistry. While these fairies usually only pass through the home their are incidences where wilderness fairies will stay in a human home. There are fairies that live in trees, in rocks, in the earth, etc. Such fairies can become dangerous if humans build on their homes. Often these fairies will act like poltergeists, pinching people in their sleep, breaking things, etc. In some places the spirits of elder trees might were known to drink the blood out of the breasts of people who build a home using their tree. Firstly never build on large sets of rocks as these are the fairies homes. Second never build on the borders between two properties, cities, lands, etc. as fairies claim the border lands. You can spend the night in a place where you are planning on building. If the fairies disturb your camp it's a sign that you shouldn't build there, if they leave your camp undisturbed it often means they are okay with the building. Offer the fairies reparations for the land. Give them milk, butter, etc. Historically animal sacrifices of various sorts (especially of horses) were common in return for the right to build on the land. A coin found on the land was also a sign that it was okay to build there. Snakes could also be a good sign as house fairies often took the form of snakes. As a writer answering questions like this, creating superstitions can add interesting elements to your culture. The name puck may come from Nisepuk. In one story a man notices a hole in log and decided to use this to make the center of his home so that a nisepuk could live in it. He then called the little fairies to his home and one decided to stay. Every day he left the little fairy butter and in return the fairy brought him luck, making him extremely wealthy. Some of these fairies become domesticated, a perminant part of households. Because of this nearly any type of fairy can become a house fairy. There's a sealkie who's a house fairy in one place, while former forest kings are fairies in another. This is based on arrangement between the humans and the fairies. In Japan there is a tengu (a raven headed and winged forest spirit) which became a household god and protected children from getting burns and houses from fires. Indeed there are likely thousands of stories about wilderness spirits which were invited into people's homes in order to help them with various tasks or provide protection from various dangers. Some wilderness fairies seem to adopt humans who move into their territory. These fairies are complected as they can be very kind to the people who they've adopted but dangerous to everyone else. In Eastern Europe the lords of the forest were known to adopt certain families, the way a person might adopt a stray kitten. However, while they were kind to their own families they would often put curses on and rob from the neighbors and other people. Thus an old prayer asking for blessings on ones own house spirit, but protection from everyone else's. In Japan animal spirits, dog spirits, snake spirits, and more might become a part of a family. They would help that family in return for a bit of food. However, they would often possess the neighbors causing illness and other trouble. Thus there were times when families who had fox spirits, etc. were driven out of villages. There are a lot of fairies who have been banished from their homes. Fairy wars and in fighting is common. A king might accuse one of the lesser fairies of having an affair with his wife obliging him to take the form of a cat and hide in a human home. Other times an invading army of fairies will drive the local fairies into hiding in human homes. Most of the time, we never hear exactly why a fairy was banished from the fairy court. These refugees tend as a general rule to try to be helpful to the family in whose home they have decided to live. Though there are some cases of them taking the form of a cat to live with the family and be cared for them without contributing anything in return. The fact that wilderness fairies pass through and often decide to live in the home means that basically any fairy can become a house fairy. This, again, is why I hate to simply create a category of fairies called house fairies. After all, even if both the kobold refugee from the mountains and the fox spirit invited by the family do many of the same things, their emotions, their feelings will be completely different. Especially when writing a book these feelings are what matters. So how does one attract and retain house fairies? 1-Keep your house clean. House fairies hate mess, they hate untidiness and laziness. Those who fail to work hard and be clean will likely be punished by the wilderness fairies who happen to pass through while those who are clean are likely to be rewarded by them. 2-Never reveal that you have a house fairy. Seriously, they hate it when people talk about them. 3-Leave butter bread and water out for them. Even if there isn't a house fairy such things are a way to get wilderness fairies to pass through regularly and possibly stay. 4-Don't swear and fight in the house. Fairies are extremely emotionally sensitive. If a two year old or an old lady would be upset by it they would as well. I will post Part 2 of House Fairies Soon.